Cornelius Petrus Johannes "Corné" Krige was born on the 21 March 1975 in Lusaka, Zambia. He was a South African rugby union footballer, now retired, who played flanker for Western Province in the Currie Cup, the Stormers in Super Rugby and captained the South African national side, the Springboks. Corne Krige was Zambian-born and his parents still reside in that country, but he was schooled in South Africa at Paarl Boys High School, about 60km from Cape Town. He played most of his rugby for South African teams and still resides in SA. Krige's Test debut came in 1999 after recovering from career-threatening knee and hand injuries. He captained the Springboks on his test debut in a 101-0 victory over Italy in Durban; unfortunately two weeks later he suffered another serious knee injury against the All Blacks in Dunedin which ended his hopes of captaining the Springboks at the 1999 Rugby World Cup in Wales. 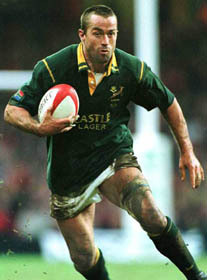 Krige appeared in 39 tests for South Africa, became the full-time captain in 2002, and captained the Boks 18 times in all before his international retirement in January 2004. Never one to shy away from dirty play, he was the subject of controversy after the November 2002 Test against England at Twickenham that saw England hand the Boks the worst defeat in their history (53-3). During the match, an increasingly frustrated South Africa side began targeting England players with physical off-the-ball attacks, and match footage showed Krige as the leader. His Super Rugby career then ended several weeks early when he was handed an eight-week ban for head-butting an opponent in 2004. He finished his career in the English Premiership with Northampton Saints, signing for the 2004-05 season. He retired at the end of that season and returned to Cape Town to pursue outside business interests. Krige would make one more high-profile appearance on a rugby field, captaining a Western Province XV against a World XV in his testimonial at Newlands on 9 June 2006. The testimonial benefited Reach For A Dream, a charity similar to and inspired by the Make-A-Wish Foundation in the United States. The World XV won 49-31 in an entertaining match that saw 12 tries in all. Krige and former Springbok teammates Bobby Skinstad and Robbie Fleck were business partners, owning Billie the B.U.M.S. Restaurant and a Cocktail Bar in Newlands. The restaurant has since closed. When the Boks played the Australia Wallabies during the later years of Krige's captaincy, he and Wallabies captain George Gregan shared an unusual distinction: both were born in the same hospital.